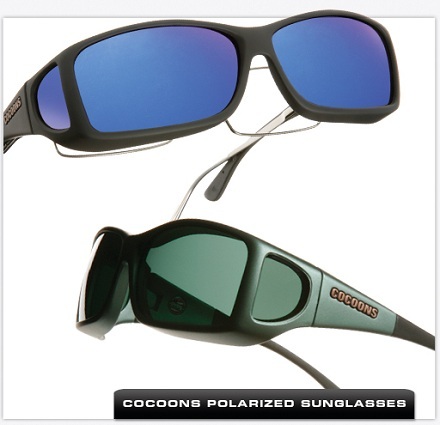 Brian Roos is the sole importer of Cocoons OveRx polarized sunglasses. Cocoons OveRx polarized sunglasses are designed to securely and comfortably fit over a wide range of prescription eyewear frame sizes and shapes. We find that a lot of our patients use them "as is " whether it is to protect contact lenses or to keep the elements at bay. Cocoons afford a perfect fit and protection at all times. The patented frames are constructed from extremely durable ballistic nylon and feature the Polaré lens system that exceeds the highest level in lens quality, the Class 1 European Standard for optical clarity and performance. All styles feature adjustable Flex2Fit® temples that enable each wearer to custom contour the temple shape for an exact fit that is extremely comfortable and secure. All Cocoons sunglasses feature a manufacturer's limited lifetime warranty.